Haiku Mill Wedding Shoot - Maui, Hawaii. 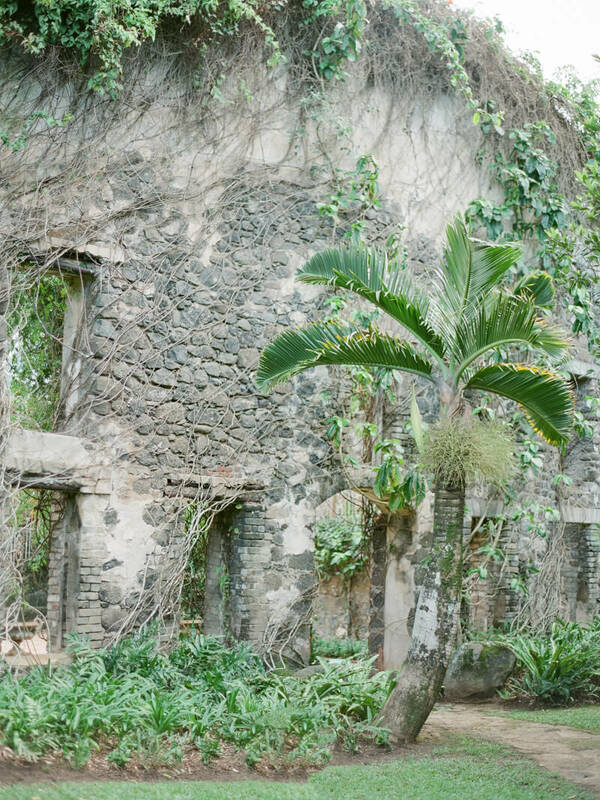 Historic Haiku Mill in Maui, Hawaii, is an idyllic location for a Hawaiian-inspired wedding shoot that blends old world elegance and tropical splendor. The property’s lush gardens and age-old relics provide a stunning backdrop and relaxed ambiance to cater to a wedding vision teeming with vibrant color and modern, stylish accents. A rich emerald green envelope holds the invitation suite. Torn parchment and handwritten script set the tone for this present-meets-past design. Palm trees and their leaves dot the property and appear in many corners of this inspirational styled shoot. The bride stuns with an elegant, beach-inspired look. Perfect for the setting, her hair is styled in a long fishtail braid and her makeup simply illuminates her face. Her bouquet is chock full of colorful, textured touches such as anemones, roses, peonies, ornamental cabbage and silver dollar eucalyptus. The bouquet matches a sprawling floral arbor that entices guests to the mill’s inspired archway. Many of the property’s vestiges are time-worn and beautiful. From the stone walls to the wrought iron stair bannister, every twist and turn tells a story. The seating chart is a simple but ingenious display. A small white sheet bears the handwritten names of all the guests and their respective tables. The outdoor celebration infuses stunning sophistication among the mill’s gardens. A brilliant lighting display hangs above the table, where three shimmering chandeliers are suspended alongside a multitude of crystal strands. The table combines the same floral design from the bouquet and arbor, producing a pop of color on the natural wooden table. Tall powder blue taper candles, simple china sets and vintage gold-rimmed glassware complete the tablescape. For a modern twist, the cake is a square creation that features a crackled effect on the bottom and a rose-inspired design on top. It emulates the timeless, yet trendy vibe of the entire shoot. Another bridal look includes a beaded halter-style gown with a sheer neckline and long flowing skirt. The bride makes her way to the beach, a short distance from the property. Sand, sea turtles and silky waves greet her as she waits for the groom. The free-spirited groom simply dons board shorts and a lei as they share a tender moment atop a beached rock. With the waves crashing around them, they hop into the water and walk hand-in-hand to head off into the sunset. A Haiku Mill wedding fills our minds with color, culture and creativity. This styled shoot combines a unique mix of history and present-day style. 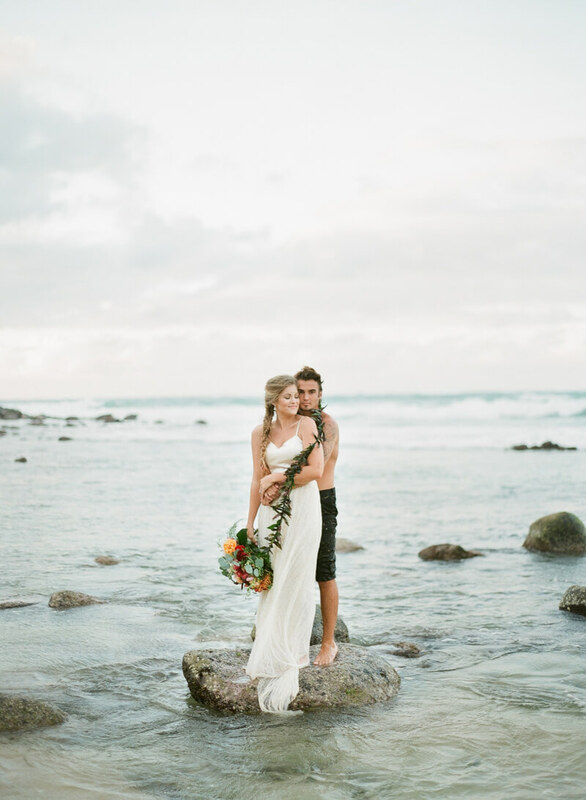 As sure as the tide, it’s hard to top this gorgeous Maui wedding vision.